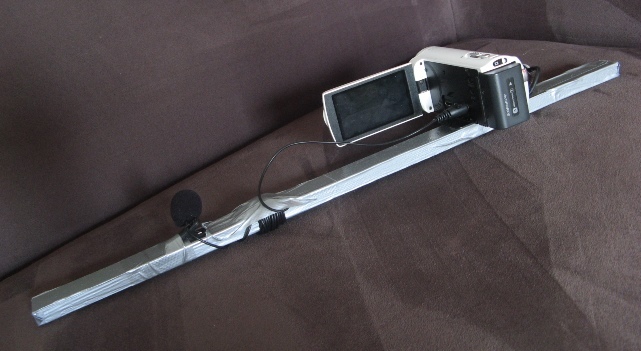 The solution for all this is extremely simple: a bar to mount the camera on plus an external microphone. The camera is mounted to the right with a simple bolt (ideally a winged bold for quicker fastening/releasing). Two little ridges prevent the camera from turning on the bolt. With the camera centered in would not be possible to operate the buttons without taking my hand from the bar. The microphone sits on the left end. It is a very cheap one from Hongkong: about 6 dollars, shipping included(! ), but the quality is quite satisfactory. It’s mono, I don’t know if the camera would record in stereo using an external mic. According to Sony’s documentation it doesn’t even have an option for an external mic… Also funny: I had to secure the little foam ball to the mic. Really: what’s the point of a wind noise silencer that gets blown off even at low wind speed??? The effect of using this simple tool is amazing. For an example see this video. I can even walk with the camera without a dancing image as a result. A pleasant side effect is that other people see I’m filming and step away easily. With only the camera in my hand I have much more people hardly noticing it and walking between me and the subject. The bar in the pics is a first try. It does not look very professional with all the duct tape but the piece of wood was a leftover I found in my shed; I don’t like chips in my fingers and the tape also keeps the cable from the microphone from dangling around. Maybe I make another from two pieces of pvc tube and a sleeve which would make it easier to store in my backpack. On YouTube there are many DIY camera stabilizer instruction videos. Some of the designs probably work much better than mine, but as I have to keep weight and volume of my luggage as low as possible this must do the trick. « Sacrilege! A cup holder in an Alfa!